SAN DIEGO - For some, the apology went too far. For others, it didn’t go far enough. For many, it was just right. The president of one of the largest police organizations in the United States on Monday apologized for historical mistreatment of minorities, calling it a “dark side of our shared history” that must be acknowledged and overcome. Terrence Cunningham, president of the International Association of Chiefs of Police, said at the group’s annual conference that police have historically been a face of oppression, enforcing laws that ensured legalized discrimination and denial of basic rights. He was not more specific. Cunningham said today’s officers are not to blame for past injustices. He did not speak in detail about modern policing, but said events over the past several years have undermined public trust. His comments come as police shootings of black men have roiled communities in Ferguson, Missouri; Baton Rouge, Louisiana; and suburban St. Paul, Minnesota; and as black shooters have targeted officers in Dallas, the St. Louis suburb of Ballwin and Baton Rouge. “While we obviously cannot change the past, it is clear that we must change the future,” Cunningham said. “We must forge a path that allows us to move beyond our history and identify common solutions to better protect our communities. “For our part, the first step in this process is for law enforcement and the (International Association of Chiefs of Police) to acknowledge and apologize for the actions of the past and the role that our profession has played in society’s historical mistreatment of communities of color,” he said. How can we improve relations between police and minority communities? Cunningham received a standing ovation for his remarks from thousands of law enforcement officials before he introduced U.S. Attorney General Loretta Lynch, who largely avoided the topic. 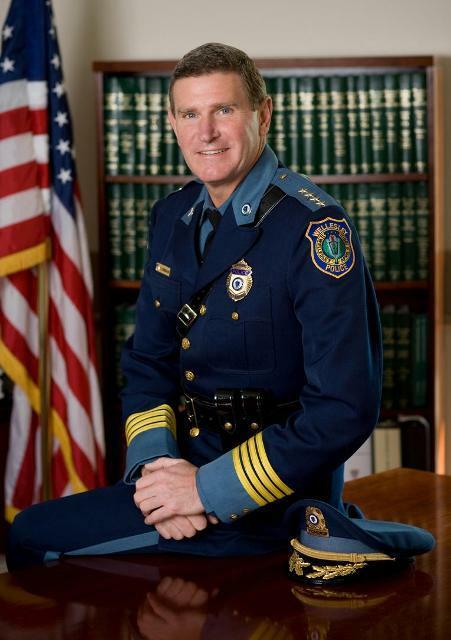 He has been police chief since 1999 in his hometown of Wellesley, Massachusetts, an affluent, overwhelmingly white, low-crime suburb near Boston. He served three years as vice president of the police chiefs association before becoming president in 2015 for a one-year term. Reactions among fellow top cops was mixed. David Alexander III, police chief in Pensacola, Florida, said recognizing historical injustices is key to addressing race relations, just as acknowledging domestic violence was a step forward. Lt. Bob Kroll, head of the Police Officers Federation of Minneapolis, thought Cunningham’s statement went too far. Kroll has had to deal with two high-profile racial incidents in the last few years: In one, two white officers fatally shot a black man last November; in another, a woman filmed the slow death of her boyfriend after a police offcer shot him while he was still in the car with her and her daughter. Delrish Moss, who has been police chief of Ferguson, Missouri, since May and is black, said he had negative encounters with police when he was growing up, including being called racial epithets. Leaders of the Black Lives Matter movement were less enthusiastic. Campaign Zero co-founder DeRay Mckesson said he looked forward to Cunningham’s comments being backed up by deep, structural changes to policing and the criminal justice system.